Containing THE very best palette of bright colours ever seen in begonias, including some completely new shades. 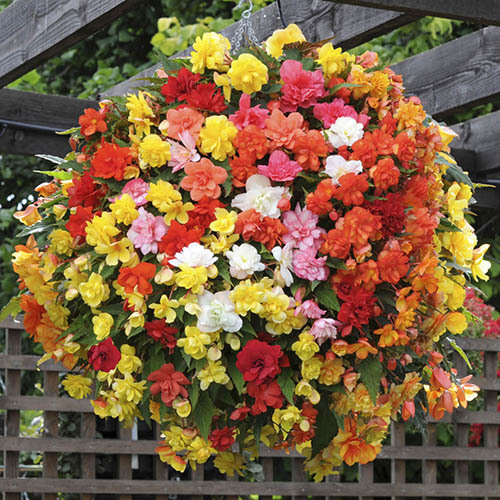 Will provide you with the most torrential summer-long display of semi-double cascading double begonia blooms - each 3-4' across! Grow in hanging baskets, window boxes and patio containers - anywhere that will allow the plants to cascade freely. Illuminate your summer displays with the very latest and best trailing Begonia - Super Cascade Mixed… Containing THE very best palette of bright colours ever seen in begonias, including some completely new shades, Super Cascade will provide you with the most torrential summer-long display of semi-double cascading double begonia blooms - each 3-4' across! Super Cascade is ideally suited for the British climate too with strong, very weather resistant blooms - giving you a cascading rainbow of colour from May until early November. Grow in hanging baskets, window boxes and patio containers - anywhere that will allow the plants to cascade freely, then just wait for the flowers - whatever the weather! Trails to 60 cm (24'). You can remove the single female flowers to encourage more of the large double male flowers to be produced if you wish - although we like to leave them on for a fuller display. Deadhead faded blooms to extend the flowering period. Begonia ‘Super Cascade' grows well in sun and shade, and its trailing habit makes it perfect for growing in pots and hanging baskets. For best results keep plants well watered, and feed fortnightly with a high-potash fertiliser to prolong flowering. Remove faded flowers to encorage more blooms. Garden Ready Begonia plugs can be planted straight into containers and baskets. When all risk of frost has passed, acclimatise begonia plants to outdoor conditions over a period of 7 to 10 days. Choose a sunny or semi shaded position that is protected from strong winds - a cold frame is ideal. Feed and water plants frequently throughout the growing season taking care not to over-water, as this will cause new begona flower buds to drop. Deadhead the single female flowers to encourage more of the large double male flowers to be produced and to extend the flowering period.